Arrive at Dubai and transfer to hotel. Evening at leisure or shop around at the market. Night stay at hotel. Breakfast. 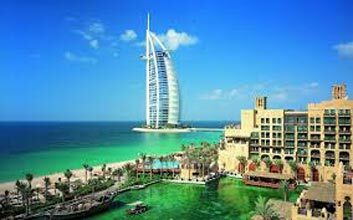 Proceed for half-day city tour of Dubai. Enjoy Desert Safari in the evening. Relish a BBQ dinner, belly dancing and camel riding. Overnight at hotel. Breakfast. Day at leisure or go shopping. Get ready in the evening for a Dinner cruise. Enjoy a nice dinner aboard. Night stay at hotel. Breakfast. Day at leisure. Nightlong stay at hotel. Breakfast. Check-out for the airport. Board a flight to way back home.